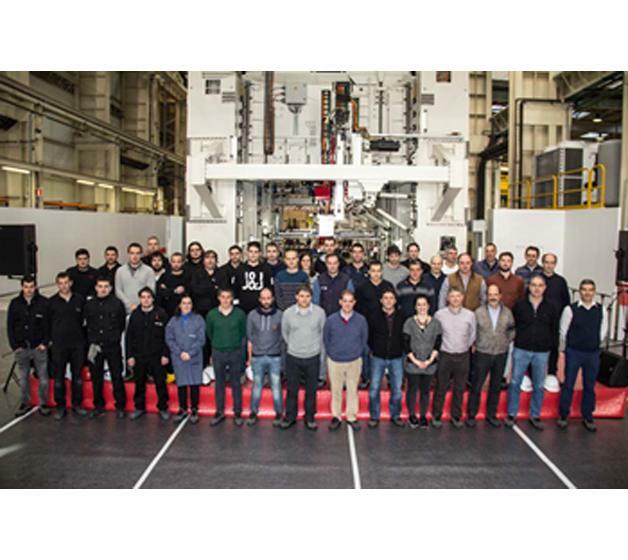 FAGOR ARRASATE starts its 60th birthday year with a week of open days to show the 1st servo-conventional hybrid high-speed line to be installed in Europe. The Guipuzcoan cooperative ended 2016 with consolidated sales of 225 million euros and a workforce of 868 people, continuing its positive evolution in spite of the general uncertainties surrounding some of the sectors that it serves and various geographic markets of importance in recent years. In fact, FAGOR ARRASATE continues to improve its position in the Automotive sector worldwide, where it is one of the leaders in the supply of high value-added stamping systems. Its main customers include OEMs such as Volkswagen Group, Daimler, Ford, General Motors, Great Wall, Foton, and TIER1 of Gestamp, CIE, Sodecia, GKN, etc. Despite the fall in investments in the steel sector the cooperative maintains a well-established position worldwide, and supplies top-level finishing lines to customers such as Acerinox, Tata, Arcelor, Outokumpu, Gonvarri, Bamesa, Baosteel, Mahindra, etc. FAGOR ARRASATE has also been growing in the Electrical Household Appliances sector in recent years, developing very specialised lines for the manufacture of exterior parts of different appliances. Its main customers include Electrolux, Whirlpool, Bosch Siemens, Haier, General Electric, Liebherr, Mabe, etc. Internationalisation has for years been a hallmark of the company with 90% of its products sold outside Spain. Since 2008 it has had a factory in China, in Kunshan, employing 130 people and giving great added value to its strategy in Asia. In 2017, two new international facilities will be opened in Germany and Mexico with a strong customer service vocation. Commitment to R&D is another of the pillars that underpin the success of FAGOR ARRASATE. For more than 10 years it has had Koniker, an accredited R&D unit in the Basque Government's Science and Technology Network, where more than 25 engineers develop long-term projects. In addition to this, collaborations with other Research Centres and Universities and a significant number of R&D projects with other industrial partners form a decided strategy for innovation and development. The servo-conventional hybrid high-speed line project for VW Group will be implemented in SEAT in 2017. The order for this project was obtained in January 2006 and consists of 6 presses installed in line. The concept of press lines for the manufacture of car body parts has been used for years, but the singularity of this installation is that it will be the 1st line where the head press will be servo and the rest will be conventional presses. With this design, FAGOR ARRASATE has managed to fully optimise the investment cost/productivity ratio. This was a key factor behind SEAT deciding to give this order to the Guipuzcoan company. The head press is 2,100 tons and the 5 conventional presses are 1,200 tons. It is a fully automated line for which the chosen partner was the Swiss company Güdel. SEAT will use this line to basically manufacture the panels of the Audi A1 that it will start to assemble in Martorell at the end of this year. Beginning on the 24th, the cooperative organised a week of open days where customers, suppliers and public institutions could all meet, finishing on the 28th with an open day for all its partners and family members. On the 60th anniversary of its creation, FAGOR ARRASATE begins a new strategic period having recently completed its Strategic Plan 2017-2020. In addition to the rest of the goals established, this new stamping concept will be progressively developed in the market, with the cooperative addressing this opportunity from a unique position by supplying this line to SEAT.